Thomas Wright, Specimens of Old Christmas Carols Selected from Manuscripts and Printed Books (London: The Percy Society, 1841), pp. 3-4. SONG OF THE BOAR'S HEAD. From MS. Porkington, No. 10. sm, 4to. sec. 15. on paper. This Song or Carol differs from the two on the same subject printed in Ritson's Ancient Songs, p. 126. Hey, hey, hey, hey, the borrys hede is armyd gay. I pray yow alle with me to synge. Reysons of corrons, with odyre spysis moo. It ends abruptly thus at the bottom of a page. Above the carol in Wright's Specimens of Old Christmas Carols is the following: "From the Porkington MS. of the fifteenth century, communicated by Sir Frederick Madden to the Reliquiæ Antiquæ, vol. ii. p. 30. It appears to end imperfectly." In the Preface to Vol. 1, Reliquiæ Antiquæ, which is dated Dec. 30th, 1840, the editors wrote that Sir Frederick Madden was among those who materially assisted in the course of the present volume. The Preface to Specimens volume is dated December, 1841. This carol has the odd distinction of having been first printed in one volume (Specimens of Old Christmas Carols, 1841) with attribution being given to a second volume that was published subsequently to the first (Reliquiæ Antiquæ, Vol. 2, 1845). The versions are identical (that is not always the case). 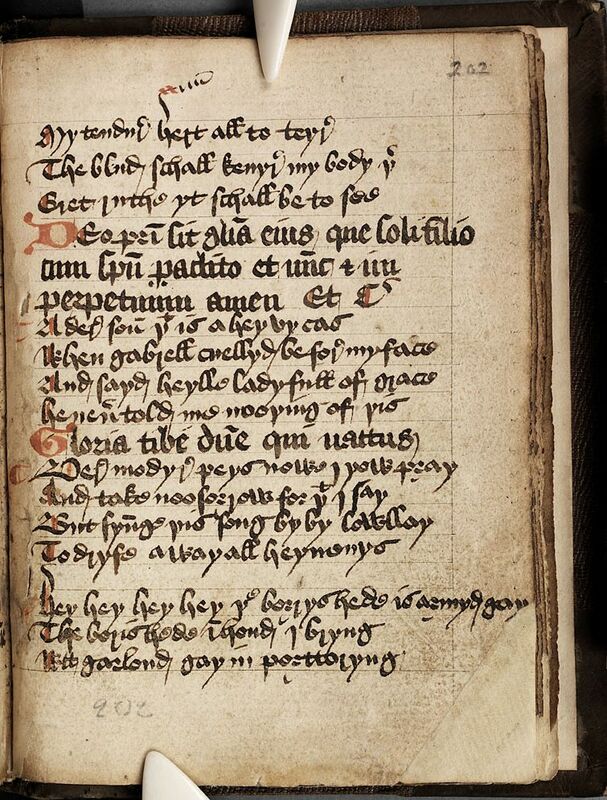 This mid-fifteenth-century miscellany of prose and verse, formerly known as Porkington 10, is one of the most important medieval English manuscripts at the National Library. Written on paper and parchment, it contains a remarkable variety of texts, mainly in Middle English though a few are in Latin. These cover subjects from political prophecy to instructions for computing the position of the moon, from weather lore to medicine, from an Arthurian poem relating the adventures of Sir Gawain to saints' lives, and from love poetry and drinking songs to carols. Richard Leighton Greene cites his source as "Lord Harlech, Brogyntyn, Oswestry. MS. Porkington 10. XV Century." The Early English Carols (1932), Carol 135. To the phrase “blwet of allmayn,” Furnivall notes that “allmayn” is a wine. He further notes that “Recipes for the dish Brouet of Almayne (H. O. ), Brewet of Almony, Breuet de Almonde, are in Household Ordinances, p. 456. 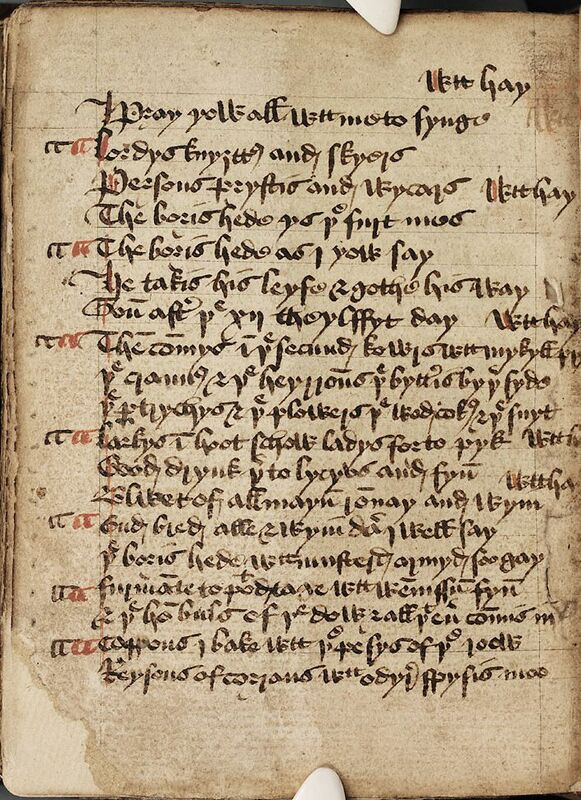 Forme of Cury, p. 29, and Liber Cure Cocorum, p. 12.” These recipes are available in other Fifteenth Century cookbooks as well. He also notes that the recipe for Potage de Frumenty is in Household Ordinances, p. 425. As of Feb. 10, 2013, “Household Ordinances” has not yet been scanned and posted to either Google Books or the Internet Archive. In short, the presentation of the head was little more than ceremonial. After the Head was presented, it would seem likely that the rest of the roasted pig was carved and served being the remainder of a fit first course. We still do this today anytime that we go to a barbeque (baby back ribs, pulled pork sandwiches, etc. ), have a pork roast for dinner, a ham sandwich for lunch, or bacon (with eggs, etc.) for breakfast. Note: The “Twelfth Day” is January 6th (Epiphany, the last day of the Christmas-tide in some traditions.). One unusual aspect of this carol is the stark difference between the first three verses and the last three verses. Other have observed, and I agree, that the first three verses were a separate carol to which was appended the balance of the song, as a sort of expansion on the description of the feast. An entirely different song, with a different meter, would be necessary for verses 4 and 5; verse 6 is completely different from the preceding five (although it might be stretched to match the tune and meter of verses 4 and 5, doubled). Also found in William Sandys, Christmas-tide, Its History, Festivities and Carols, With Their Music (London: John Russell Smith, 1852), #12, pp. 230-1, virtually identical to the text found above. No notes to the carol, however, he does have a brief discussion of the boar's head carol in his history: The Boars Head Feast.